102.N MakeUp Chair: foldable wooden chair. Adjustable height for comfortable makeup sessions. First choice beech wood, Handmade in Italy. Lacquered in black. Back and sitting in micropore black fabric, waterproof and easily washable. Very durable. Foldable antislip footrest. The chair is quick to fold. If you need to bring it frequently around we recommend buying the cover accessory B02 or B02.TR (with or without trolley system) together with the chair. HR System Headrest for S102.N: the headrest system you can put on and off and adjust in a while, no need for tools. You can regulate it in height and gradient. The back of the chair can be customized with a logo or text. Please take note of the customization mode and formats of the graphics to send shown below. 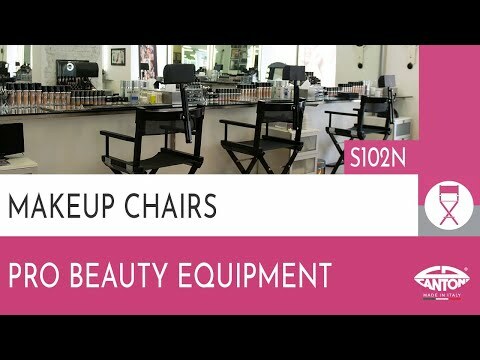 This chair kit for pro makeup artist is stable, durable, able to withstand even important weights . In first choice beech wood with certification of origin, the chair is produced by craftsmen in Italy and hand-lacquered with non-toxic black paint. The makeup artist chair can be set at the required height by a simple movement with the foot. This useful feature allows the make-up artist to work in an upright position, thus protecting the health of their back and maximizing the quality of their work. To buy the cover for this chair, please click on the "option" tab and discover them all. PRINT OF YOUR LOGO: If you want the product you've chosen to be printed with your logo, select the appropriate option. After completing your order, please send us an email with attached the file for printing at cantonionline@cantonionline.com. We will accept only vector format files in one path and one color. The print output, by default, will be in white color. Perfect for makeup artists working either in studio and on the move, because it's easy to fold and beautiful to show. Recommended for beauty professionals working on long makeup sessions: you can work up-standing (no back ache) and you customers will be comfortable and still, in the perfect position to paint them.